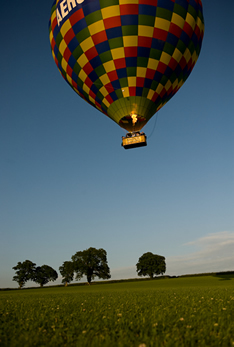 Why not choose to fly over the beautiful scenery of Tiverton and Mid Devon? Tiverton is easily accessible from a number of locations across the county and lies at the junction of two important road routes, the A361 and the A393. The A361 provides an important link between the M5 Motorway and the towns of Barnstaple and Bideford. Tiverton is the largest town in Mid Devon with a population of approximately 20,000 and has two beautiful rivers, the Exe and the Lowman, which join just south of the Town Centre. The town also boasts a canal, were visitors can experience trips in boats travelling through idyllic scenery. You and your fellow passengers will meet at the Hartnoll Hotel, a luxurious newly refurbished hotel with facilities including a bar and an excellent restaurant serving breakfast. The hotel is situated on the River Exe and opposite the very popular National Trust location Knightshayes Court which may make an interesting excursion if you wish to visit after a morning flight. After taking off you will experience the wonderful scenery of Mid Devon. Lush rolling hills, dramatic landscapes and chocolate box houses are all part of the tapestry on the ground and photo opportunities are boundless. Routes cannot be guaranteed but often flights from this location glide over the picturesque Grand Central canal towards the historic villages of Sampford Peverell, Calverleigh and Bickleigh where the River Exe and the smaller River Dart meet with an attractive medieval stone bridge. Sadly as is the way with all good things your balloon ride will eventually come to an end and you will land where you will be met by your crew. The balloon will be deflated and those who are willing and able will help to pack it away while certificates are presented by the pilot. There are more photo opportunities again and an opportunity to purchase ballooning merchandise if you want to become an honorary member of the Aerosaurus crew! When all the activities are over you will be transferred back to your starting point where you can indulge in a spot of refreshment (light or otherwise!) and then chat to your fellow passengers and new friends about your memorable experience.